This review of Red Sister is long overdue, I read it way back in April but never got around to reviewing it since I was already backlogged on reviews. Luckily, it’s one of the best books that I read this year and I still remember it very well. Red Sister follows Nona Grey, a young girl accused of a heinous crime and sent away from her home. She ends up at the Convent of Sweet Mercy, where children with the right heritage are taught to be deadly killers and powerful mages. She finds more than just a place to live, she is truly challenged for the first time, she uncovers parts of her personality she never knew had and makes friends closer than family. But Nona’s considerable talents and violent past put her in the middle of long-simmering power struggles within the church and the empire, and she makes quite a few enemies as well. This book is one of my favorite sub-genres of fantasy, the coming of age and training of the main character. Most of Red Sister is set entirely in the convent, which seems likes it could get boring fast but ends up being utterly riveting. Nona is a great protagonist – she can be pretty intense at times which makes her both scary and vulnerable, she’s got an interesting backstory, and she reacts like a real person to the things that happen around her (unlike many fantasy characters). It is a pleasure to watch her slowly transform from a mistrustful and hurt young girl to the confident and formidable person that she is at the end. The most unique thing about this book is the way it depicts female friendships. I can think of a bunch of different books that have great male friendships (Riyria’s Royce and Hadrian, the Gentemen Bastards’ Locke and Jean, to name a couple) but I really can’t think of many books that draw attention to women who are friends. 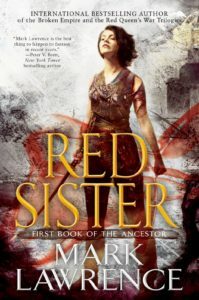 Red Sister doesn’t just focus on them, it makes them the core of the book – Nona’s friendships drive her to grow, provide a source of tension (without melodrama), and make for some pretty heartwarming moments. Yes, there’s a lot of intrigue and action, but none of it would matter if we didn’t care about these relationships so much. I also really liked the world that this book was set in. It reminded me of N.K. Jemisin’s Broken Earth books – it’s a world that’s slowly dying, and the people living in it now that have access to technology but any understanding of how it all works has been lost for generations. So far, the state of the world hasn’t made much of an impact on Nona’s life, but I assume it will become more relevant in the next two books. I can’t wait for the next book, Grey Sister, to come out! At least I haven’t read most of Mark Lawrence’s other work, so I have something to tide me over.